The Arm Curl Bench allows you to put more intensity into working your biceps. It is built with comfort, function, and durability in mind, allowing arm work to be completed using proper form. Six different arm rest adjustments designed to fit your body Dumbbells and Weights not included. • Build and define your body. • Six-position arm rest adjustment. • Extra Wide & Thick Gym Quality Padding. •High density, tapered, dual-layer seat pad measures. • Bar catch for added convenience. • Ideal for in-home and light institutional use. • Six-position adjustment bar rest Pull-pins and knobs for adjustments. • Material: Sturdy and durable Q195 Steel. • Outter Tube Size: 50*50*2MM/2x2x0.08 inch; Inner Tube Size: 45*45*2MM/1.77x1.77x0.08 inch. • Thickness of the Pad: 2inch. • Size of Pad: 350*240*50MM/13.77x9.45x2 inch. • Size of side cushion: 400*300*50MM/15.75x11.81x2 inch. • Whole Size: 725*690*790-890MM/28.5x27.16x31-35(max) inch. • Bar Rest Adjustment: 18" - 22"(H). • Arm Rest Adjustment: Six-position 31" - 35"(H). • Max Loading: 550 lbs. • Product Weight: 30 lbs. 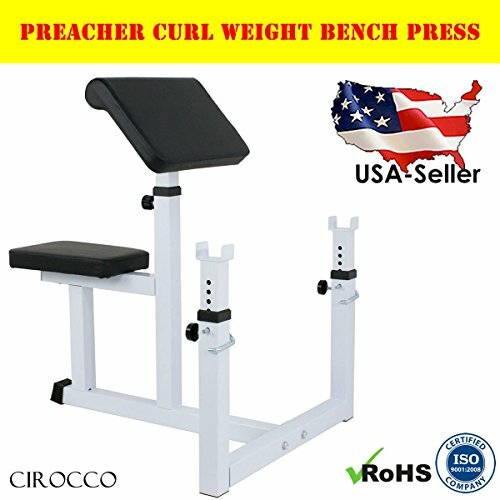 • 1 x Arm curl bench (need assembled). SIX POSITION BAR REST ADJUSTMENT with Pull-pins and knobs for adjustments.